Colombin will hold a Cherry Blossom Fair at all Colombin shops and salons in the Kanto, Chukyo and Kansai Regions from the 9th of March. 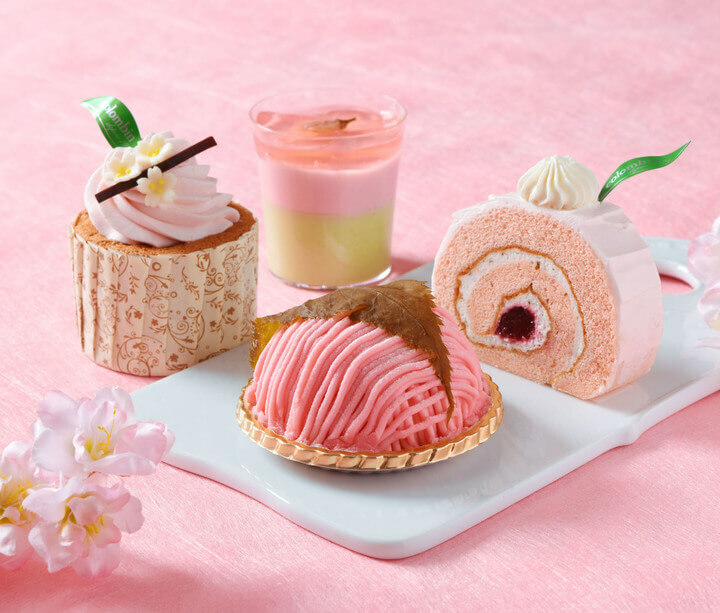 Four kinds of sweets items including the ube cake and cup dessert as well as “Sakura no Mont-blanc” which is very popular will be offered. Cherry blossom cream using white bean-jam is placed on top of jocund dough and fromage yogurt mousse that has a cherry-blossom flavor. The sourness of the griot jam matches well with the sweetness of the Mont-blanc. A light textured chiffon cake which has the flavor of cherry blossoms. It is a seasonal product where the petals of cherry blossoms made of chocolate are placed on top the cherry blossom whipped cream. Pink-colored bavarois and transparent jelly with a peach flavor are stuffed inside a smooth mousse that has the flavor of Ujimatcha. The product is very cute since petals of cherry-blossoms are placed on top. Cherry-blossom whipped cream made using cherry-blossom leaves and white bean-jam is wrapped in a sponge cake dough. A jelly made of griot cherries is stuffed inside the cake.